From Lisin to the Ryazantsev – The Master Show's fastest and strongest. Maxim Afinogenov, Evgeny Kuznetsov, Denis Kulyash, Brandon Kozun and many more... KHL.ru looks back at the great players from far and wide, whose speed or strength has earned them a place on the Master Show roll of honor. Since at least the first Olympiad in the year 776 BC, people have been fascinated by contests of speed and strength, so it is no surprise that of all the tests and trials in the Master Show skills competition, it is the Fastest Skater and the Hardest Shot which most frequently capture the fans' imagination. In anticipation of the 10th All-Star Game and Master Show, held next month in Astana, we at KHL.ru decided to take a nostalgic look back at the winners from the previous nine seasonns. The first ever KHL All-Star Game, and the first ever Master Show. The setting could hardly be more romantic – Moscow's Red Square – but the open-air rink was hardly the ideal skating surface, and the January air chilled the bones of players and fans alike. Still, when the going gets tough, the likes of Alexander Radulov get going. He was not long back in his homeland after five years in North America, but the change in climate from Nashville to Moscow did not faze the young forward at all. Throughout his long and varied career, Parshin played for several clubs, but in 2010 his best years – the three seasons he spent at Avangard – were still ahead of him. He was only 23 when he received the call-up for the second All-Star Game, and his shooting skills were still in need of some fine-tuning, but there were no doubts over his speed. Young Denis secured victory in the Fastest Skater by completing the circuit in under 14 seconds, the first time this had been done in the history of All-Star Games in Russia. Now that his career is enjoying an Indian summer, at last year's All-Star Game Maxim Afinogenov was billed as the wise old veteran at plucky little Vityaz, but back in 2011 he was still Mad Max, and had enlisted for the Petersburg Army Men after returning home from NHL duty with the Sabres and Thrashers. His season had been blighted by injury, but he still showed why he was regarded as one of the fastest Russian players, although he failed to match Parshin's record by a margin of three hundredths of a second. 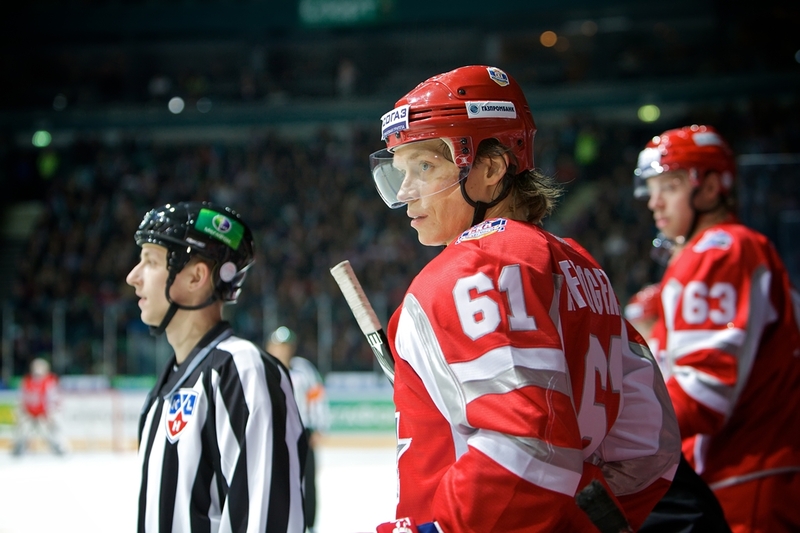 The 2012 event in Riga was the second time the All-Star Game was held beyond the borders of the Russian Federation, after the successful staging by Minsk, and the local heroes of Dinamo supplied four players to the Team West roster. There was captain Sandis Ozolins, goalie Chris Holt, forward Martins Karsums and his fellow attacker, Mikelis Redlihs, and it was the last of the four who was the first in the speed contest. Roared on by a passionate and partisan home crowd, Redlihs set a new record. This year saw not only the first time the All-Star Game was held in the East, but also the first time the festivities were held over two days. This at least meant that the participants in the Master Show had no need to entertain thoughts of conserving energy for the game. The stand-out names in this post-lockout All-Star Game were Pavel Datsyuk and Ilya Kovalchuk, but for the townsfolk of the host city, hockey-mad Chelyabinsk, there was a third superstar name - their very own Evgeny Kuznetsov. And as with the year before, the cheers from the home fans seemed to spur the local boy to victory. Twice is coincidence, as the saying goes, but three times is a tendency. Following the triumphs on native ice by Redlihs and Kuznetsov, the Bratislava All-Star Game saw another stunning home victory in the Fastest Skater. Not only was Slovan's Milan Bartovic the winner, but his team-mate, Leo Komarov, was a close runner-up, a mere 0.34 seconds behind. Moreover, both of the Bratislava speed merchants broke the record set by young Evgeny the previous year. Bartovic's record stood for all of twelve months, until the Master Show at the Sochi All-Star Game, when it was smashed by a Canadian forward with Polish roots – no, not Gretzky, but former Avalanche, Coyotes, Rangers, Panthers and Capitals forward Wojtek Wolski. The Zabrze-born left-winger, later to taste Gagarin Cup glory with Metallurg, sliced nearly a third of a second off Bartovic's record. In the spring of 2017, Lokomotiv, driven by that fearsome troika of Talbot – Kontiola – Kozun, produced the sensation of the season by eliminating the favorite, CSKA, from the playoffs. The year before, Brandon, then playing in the colors of Jokerit, gave due warning to all Muscovites of his speed and athleticism when he posted the third-fastest time in the history of the Master Show. The first ever Week of Hockey Stars was staged in Ufa, and no fewer than three Bashkortostan-based players were selected for the biggest hockey festival of the year. History was to be made by a Salavat Yulaev man, but it was only by a strange twist of fate. Avangard's Vladimir Sobotka picked up an injury which ruled him out of the event, and his place was taken by another Salavat Yulaev star, Enver Lisin, and he smashed the record, and indeed, the 13-second barrier, to claim the title of the fastest ever Fastest Skater. The Czech defenseman, who had learned his trade with the Senators, Rangers, Devils, and in two spells at Lokomotiv (he would later return for a third ride with the Railwaymen), was a true star of the KHL, and was playing in the colors of Dynamo Moscow when the Hardest Shot contest was first tried out at the Master Show. His powerful shooting netted him more than 50 goals in his combined NHL and KHL careers, and it brought him victory here in Minsk. A bone-shaking shot was also a trademark of another defenseman, Denis Kulyash, and opposition goalies could be forgiven for thinking they were under cannon-fire. It is true that the power was not always accompanied by pinpoint accuracy, and on a few occasions, his shooting managed to injure team-mates in training, but in the Saint Petersburg All-Star Game everyone emerged unscathed and Denis powered his way to victory. Events at the Master Show often make waves, and after a certain episode in 2012 at Riga those waves even crossed the Atlantic. 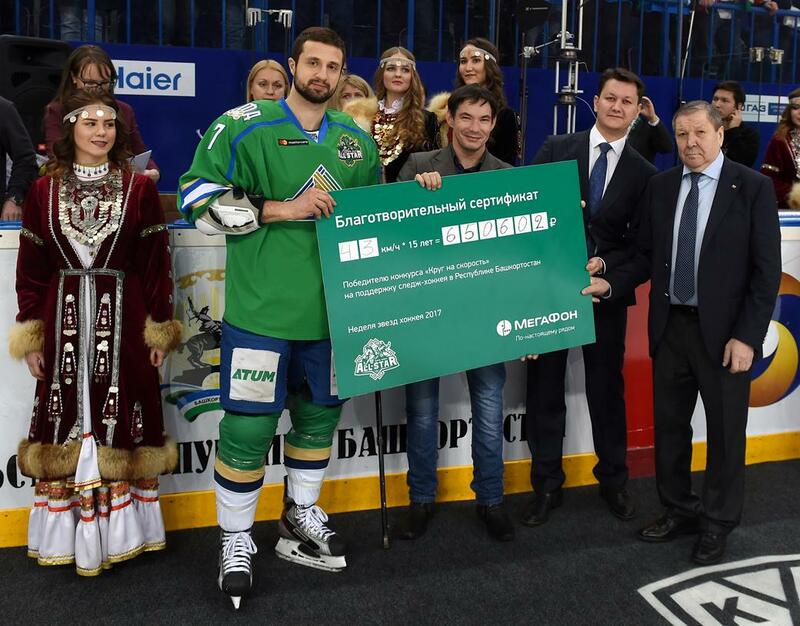 Traktor's Alexander Ryazantsev struck the puck with such force that a new world record was immediately announced. Was it really the hardest shot ever? Yes, and no. It was certainly the fastest ever timed in such an event, but the equivalent contest in the NHL demands the player shoot from a longer distance, so the added inertia on the puck's way to goal comes into play. This was a controversy not even experts in physics or ballistics could settle. Following a Traktor Man's triumph the previous year in Riga, the Chelyabinsk crowd had to put up with a Severstal player winning the contest on their home ice, but they took no little comfort from the fact it was the very same Ryazantsev taking the top prize. In fact, in the list of the top five hardest shots ever struck at KHL Master Shows, Denis Kulyash is at number two, but the other four were all the work of Alexander the Great. Following a couple of years away from his native Omsk, Denis returned to Avangard and to the All-Star Game, where he re-created his success of three years before. True, he could not threaten Ryazantsev's record, but he joined him in an elite duo – the only two players to win this contest twice. The 2014-15 season was the year of Sibir, the Cinderella team which gate-crashed the regular season and playoff parties, taking a number of illustrious scalps on the way to claiming a bronze medal place. It was only fitting, then, that in Sochi the list of the League's finest contained four of the men from Novosibirsk, including Patrik Hersley. The Norwegian legend was halfway through his first year in Russia, but he had already attracted many plaudits for the power and accuracy of his shooting, confirmed by his victory in the Master Show. By the time the stars had gathred in Moscow for the All-Star Weekend, Medvescak of Zagreb had sold most of the leading players, including the powerfully-built Slovak. Before he headed off to Germany, however, Milan took part in the big event, and with this victory he made sure all those attending in Moscow will remember him fondly. The strength of the shots has reduced overall in recent years, and in Ufa Igor Ozhiganov emerged victorious with the lowest winning speed, not quite breaking the 160 km/h barrier. Igor can consequently claim a curious Master Show record – the weakest hardest shot.